The Bailey Orion, A New Star? The Orion, the latest caravan range from Bailey of Bristol is being launched this week at the Boat and Caravan Show at the NEC in Birmingham. It’s been a closely guarded secret, but with the success of Pegasus, Unicorn and Pegasus 2, it was inevitable that Bailey would introduce another new ground-breaking caravan model range. Orion is built using the same high performance Alu-Tech construction system featured in the other Bailey caravan ranges and also includes a GRP outer skin for extra durability. The lightweight design, along with the narrow bodied, compact body shell and unique exterior profile, are designed to be more aero-dynamic to enhance towing stability and to improve fuel economy of your tow car. Being only 2.19m wide, that’s 7ft 2ins, many people will find an Orion easier to store too. 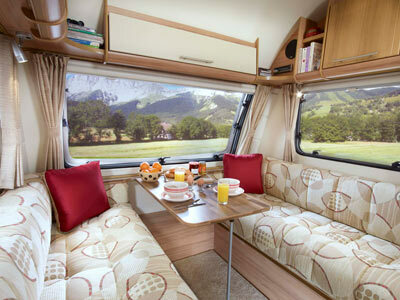 Tardis-like, the spacious interiors make best use of the space available and this means that the proven and popular layouts found in bigger and weightier caravans are available in the four model Orion range, and thus are able to accommodate from a cosy twosome to a family of five. Orion is well equipped and has a number of luxuries that maybe you wouldn’t expect given the compact nature and price of the caravans. You’ll find an 800w microwave oven and a radio/CD/MP3 player comfortably alongside standard equipment like a three burner gas hob, oven and grill and a Thetford 107 litre refrigerator with a full width freezer compartment. The heating is provided by the space saving, floor mounted Whale blown air heating system. The interior colour scheme is simple but effective with Walnut coloured Italian design furniture, with simple colours in the upholstery and bold scatter cushions. Buyers who go for the optional AL-KO Secure Wheel Lock will benefit from generous caravan insurance discounts. The Orion is on show in Hall 5 stand number 5130 and 5120. Midi-Heki roof light over front lounge area. * Prices include VAT at 20%, delivery charge not included. Just had our first service and noticed that our one year old Orion has a problem in the washroom as the inner back panel is bulging inwards as its is coming unstuck from the outer shell. The Bailey dealer says he is waiting to hear from Bailey as he thinks we might have to take it back Bailey in Bristol. Apart from the front window bowing inwards when towing which looks quite alarming when we stop, it does pop out again a little while later, we have been assured that it is quite normal. 2.5 years of ownership now of the Bailey Orion 450/5, after getting over the initial shock of how poor the standard of finish is, 5 water leaks from windows and now water leaking in from the Alutech roof joints (a 3 week wait until the dealer can look at this) I can confidently, from experiance recommend buying another brand of caravan, save your money, your marriage (if you have one) and your kids (if you have any) tears over the numerous cancelled holidays, it’s not worth it !! Hi Simon – it sounds as though you’ve had a pretty bad experience with the Bailey Orion thus far. Hopefully all is ok now? Totally agree with Ian, our 440/4 has a great layout, like wise were also new to buying a new caravan (April 2011) and just today we found a mould residue leak in the same place! i’ve sent the article to our dealer along with photo’s, i will of course keep all of you keen customer sevice people informed? We’ve had our Orion 440/4 for just under a year….and boy what a year!!! The layout is really good & it does have a homely feel to it but…. we’ve just notified our dealer of water, YES water leaking into the van when it rains & they’re saying that they can’t get it to leak in when they have a hosepipe on it. We believe it’s leaking in through the awning rail joint just above the dinette window. 5 months ago the end cupboard above the window had all the finish peeling off of it & we were guarenteed that it was’nt a damp issue but just a faulty cupboard…..now 5 months on we can actually see where the water has been getting in AND the actual caravan wall has swollen in two places. With this swollen side panel in mind, all that Bailey have said is that our dealer should reseal the area of the awning rail & problem solved!!!! These vans are supposed to have a 10yr warranty arn’t they? we’re not the only ones with this problem according to the dealers service manager. He’s had another chap with a similar water ingress problem that is still ongoing. It’s our 1st caravan and I remember our Outwell tent being more watertight than our Orion 440/4. We’ve ended up contacting ‘Consumer Direct’ and entered into the process of an official complaint & request for a satisfactory repair, replacement or refund which we are entitled to under the 1979 sale of goods act. what started out as our intention to have some good family holidays has ended up a bit of a headache to say the least. I would suggest anyone considering buying a Bailey Orion, look at what other manufacturers are offering 1st. Don’t believe the hype !!! Hi I bought our 450/5 Orion in April, we are first time caravaners with two children aged 9 and 13. We all love the layout of the Orion, as to the bunks, I know weight is recommended up to 75kgs on the top two bunks but i’m 6′ and 15 stone and can sleep happily on the bottom bunk. Top marks Bailey great caravan and I can tow it behind my petrol audi a3!! We bought an Orion 430-4 last year and absolutley love it. Fixed bed, end bathroom and light enough for our car to tow with no problems.Just what we had been looking for. Great to be able to use the shower and not have to worry about site facilities. The finish on the van is good and the only problem we had was with the water pump which the dealer replaced immediatley. Cant wait to get out in the Van again this year. I took delivery of my Orion 400/2 last June. It is my 7th caravan and 3rd Bailey. With plenty of experience of layouts, towing and design over 20 years, I would say that at last I have found my very favourite van. What a brilliant design, a real Tardis.Having previously owned a Ranger 460/2 I was, with advancing age (70) and touring solo beginning to think my caravan days were numbered. This little beauty is so easy and cheap to tow. The gas locker on the side makes for much easier access and the heating is superb. I have been caravanning throughout the winter in temps well below freezing. 2 minor faults found but dealt with quickly and with usual efficiency by Chichester caravans at Winchester. Good on you Bailey! I give my teenagers the freedom of a pup tent close to the van. Its amazing how much you can hear inside!!! we only needed the inside bunks when they were little and for the odd night when we have a very early getaway. Now they don’t always come with us being older so the 430/4 is ideal. Double bed not fussing with bedmaking every night AND a full with shower room to share. Plus being small enough to park up easily. Our model had no problems with finish and we couldn’t fault it on delivery. There’s a space for everything – try putting some of your kitchen stuff in the cupboard above the TV – just big enough to ease the pressure in the kitchen and handy if you are eating outside. Just had our first night in our new Orion 440-4 and found no faults after a ruthless inspection, she is a light compact easy tow and the spec is more than enough for us. Kingsize front bed for my tall hubbie, double converted from dinette for me (no climbing over each other at night for this old pair when nature calls). The computer on our car seems to show that she is cheap to tow as well. Sorry other people have faults etc but we could not be happier with our star. Picked up our new Bailey Orion 450-5 3 weeks ago, numerous scratches in the grp outer panels, bubbles in decals, internal trim poorly fitted, damage on wood panels inside where screw drivers have been used to screw units in, even a screw meant to hold a seat unit in on such an angle it comes out the side of the wood into the rear internal wall showing the screw thread. So So So angry with myself that I missed the external damage, I would have walked away but missed it on handover. Bailey have the making of a good starter caravan but mass production speed has over taken them i think and quality is suffering, I looked at others since having ours and could find similar on 3 others I looked at. was just about to order a new pegasus ancona dont think ill bother with it now. I like the new shape, because it’s different and more efficient. The inclusion of a proper washroom in the 430/4 beats the silly arrangement in my old Ranger 460/4 with only an increase of a few inches in total length. This will be my 3rd Bailey, and whilst each has had problems, the dealer has always been most helpful and rectified the faults. Just ensure you keep to the service schedule and sleep at nights. 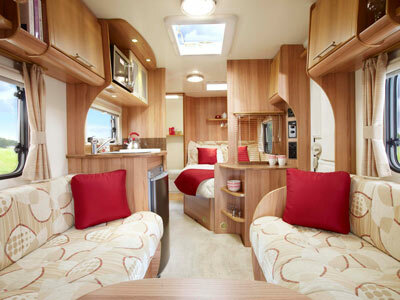 We ordered our Bailey Orion at the begining of March still awaiting delivery. Hopefully it will arrive without the faults we noticed on the show caravan we have now seen at our dealers. Having read some of the above comments I am now a little wary as we have had a Bailey Provence 7series and cannot fault it other than the weight for our car so hope we are not making a big mistake, will give further info when we get and use our new Bailey orion450. please note already had difficulty in getting bedding for small bunk beds!!! we orderd orion 430 4. 6 wks ago ,del, 2nd wk may.no contact .from dealer,I emailed bailey had a snotty .reply.more or less saying,you get itwhen you get it.and in future contact dealer.we dont garenty del.date dealer gives you.I had to read twice to realise what I had just bean told we put £100 dep. if any dealer out there will cover this loss contact me…..
Just had the wheel fall off our new Bailey Unicorn after only one outing, neither Bailey or Dealer would accept any responsibility after it happened on Easter Monday but just a few days later their has been a recall as we appear not to be the only ones who have lost a wheel. It is not so much what has happened that has angered us,as things will go wrong and thankfully no one was hurt in the accident on the dual carriageway, but until we found out about the other people who have had the same problem no one would even consider that it wasn’t lour fault in some way. This is a serious safety issue and should have been at least looked at seriously… We are amused by Bailey or dealership. Have been caravanners for years until now only buying Swift. We would not touch Bailey again, despite being bowled over by the features I. The van. 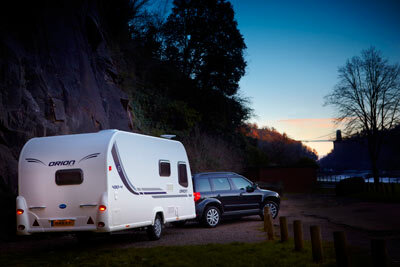 Hi just viewed the new Bailey Orion 440/4. absolutely fantastic, the flexibility of having a second dinette/double bed with a full rear washroom is really impressive. I would be able to leave the bed made up and still have a lounge area, on rainy days i could then convert the bed back into a dinette. The finish is lovely with a warm and cosy feel, this is due to the wood they have used, the lighting is great for an entry level van. Just wish i could afford one now! This new Bailey looks like the same shape as one of my mum’s old jelly moulds! Dreadful! Bailey just don’t seem to be in the same league as the new Swifts! We had a Bailey Indiana which we loved but the bathroom was not right for us. We sold this and bought a Pegasus 554. Fantastic. We have been out in all weathers. 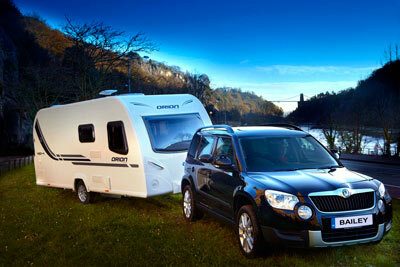 Our dealer ‘Venture caravans’ have been fantastic. We bought the van last February and have had the first service £150 plus VAT. This went very well all we had was a slightly leaky kitchen tap, covered under warranty! Very happy with van, but why have Bailey dropped the transverse bed and why lose the light coloured wood? Microwave looks better in Pegasus 2, but we still prefer everything else in our van! If you get a good dealer then you should have no problems. After deciding to buy our first caravan in September 2010, we chose a “Bailey Pegasus 534” from Ropers World, as the layout, build quality, Alu-Tec technology together with Alko fitments ticked all the boxes for us. We have used it a few times before winter storing it and cant wait to get it back for this years holidays, as it is just like having our own mobile apartment , so comfortable and well equipped, certainly the right choice for us, so if the new Orion is anything like, then it should be a winner too! Thank you Bailey, we are very happy “first van” customers. What about a six berth? Having boughts a Bailey Unicorn in October I would never buy a Bailey again we have in excess of 25 faults. On our first and only outing a week after picking the van up, the heating packed up after 2hrs. We had to have a new pump. We booked to go away for New Year tested the heating first and found water leaking under the front seats, so holiday cancelled. The van has been at the dealers for 4 weeks now having faults rectified, these include new blinds, cupboard doors, draw fronts, seating the list goes on. We have to keep phoning the dealer as they do not contact us. No word from Baileys. We have lost 3 months subscription on caravan and camping club. No date has been given for the return of out van as yet. Bailey caravans steer clear as customer service and quality are non existnt. Come on bailey do your reasearch properly, children grow, bunks big enough for teenagers would be great!. Love the fact that Bailey are trying to appeal to budget buyers, but wondering where the 6 berth van is in this range? the market is huge for family vans, and im hoping that my 3 children are camping with us for years to come yet, but we aren’t tempted to change our sprite major 6 and spend money until we find big enough beds. Yet another new bailey. I have looked and looked but NOTHING come close in the “New Bailey Range” to my 2004 Provence.The build quility is excellent and the layout superb When are Bailey going to learn that quality comes first. If you look closely at the new Baileys “mass production” means a fall in build finish.Next time you see a new Bailey look very closely inside and out the build quality is nowhere anything like the early 2000/2005 vans. Wake up Bailey raise the quality over quantity! Having had 2 Baileys we have now bought an Adria Altea 542DT which is the only van we have found with bunk beds big enough for our teenagers! This new range looks nice. 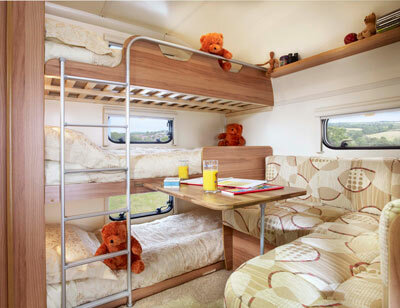 However, as with all the other manufacturers, Bailey have again stuck to standard ‘skinny-width’ bunk beds in favour of a wider adjacent seat. Other manufacturers, including Bailey in other ranges, use a side table to fill the gap between a side dinette, again restricting the width of bunk-beds. It’s no-wonder teenagers grow out of caravanning, manufacturers don’t make beds wide enough for them to turn over. Why can’t someone make a caravan with full width bunk-beds? 2 x wider bunks, adjacent to a side dinette/bed with a pull out overhead bunk would provide comfortable sleeping and useable caravan space for up to 6. If I had to sleep in a standard width caravan bunk, I wouldn’t look forward to a fortninght in my ‘van. My nephews had filled out and 6 foot at age 15 – too young to holiday alone, two big to fit comfortably in a kids bunk. Manufacturers could extend the time kids want to tag along by making beds fit for purpose. So much thought goes into every other aspect, why do they think kids are all bean-poles? Hi i do not usually do this but i really had to. The inside looks great ( BUT ) what have you done with the rear outside it looks all full and that comes from a big Baily fan who has more than one for over 25 years. If the Pegasus was anything to go by, all I can say is ” Let the buyer beware”!!! Build and finish quality standards in my Pegasus were below standard and one year later I am still waiting for the balance of the problems to be rectified. The expense and inconvenience of having to foot the cost of taking the caravan to the agent for work to be done ads further insult.